SERVICE, QUALITY . . .
“Aloha” is more than a word of greeting or farewell. Aloha means mutual regard and affection and extends warmth in caring with no obligation in return. We take the true meaning of the ‘Aloha Spirit’ to heart, and put that beautiful energy into all we do … we strive to instill 'Hawaiian style' living into our guest’s experience and provide a level of quality that is beyond compare! 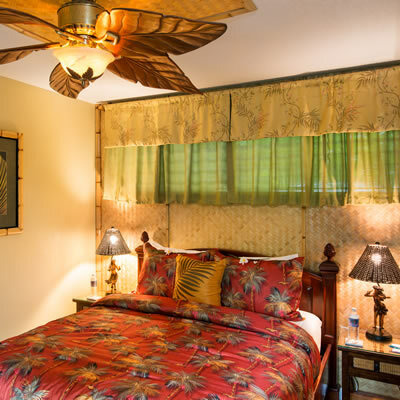 Your visit to Big Island will be filled with "Aloha Spirit" in our plantation style Bed & Breakfast along with concierge class service you would expect in a boutique hotel. Come share our amazing island’s Aloha and discover the magic for yourself. Honu Kai is extremely conscious of our environment and embraces Mālama Honua. We are 100% solar powered. We have been recognized as a Platinum Level Green Leader by TripAdvisor, their highest level of recognition. We use biodegradable toiletries, water efficient fixtures, Energy Star appliances, recycle waste, encourage towel and linen reuse, provide reusable water bottles and serve locally sourced or on-site grown organic produce. 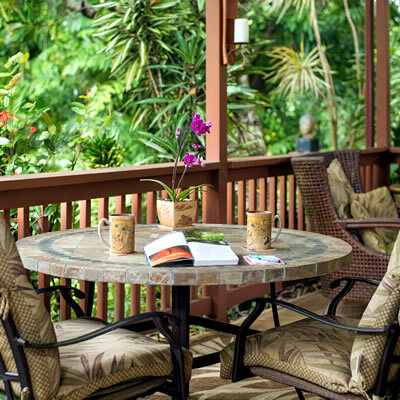 We have been rated #1 Bed & Breakfast in Hawai'i by TripAdvisor for over 10 years and were #5 in the United States. We have been awarded their Traveler's Choice and Certificate of Excellence for several consecutive years. Honu Kai received the Best of Kailua-Kona Hotels for 4 consecutive years in 2019 and has been chosen best place to stay in Kona by several Hawai'i publications. Come visit us and find out why! What Our Guests Are Saying . . .
An ALOHA experience to the core! For our honeymoon trip to Hawaii, we were looking for a place that would give us a true Hawaiian experience. We are so glad we found Honu Kai! Dave and Wendi are the best hosts ever. They are genuinely thoughtful about their guest’s experience in Hawaii . . .
We are just finishing our seven day vacation on this beautiful island. From the moment we arrived at Wendi and Dave’s, we knew we were home. We were welcomed by name and offered a drink to relax. Each morning we were greeted with delicious Kona coffee and the most amazing breakfast! 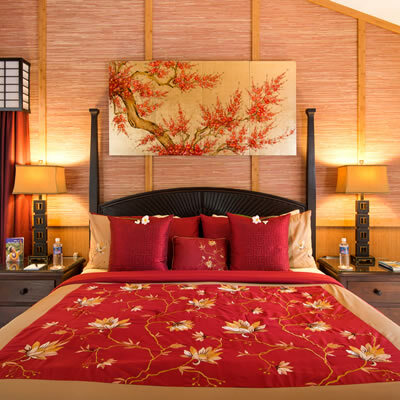 This oversized room offers a Cal King bed, with Asian inspired furnishings and a calming view of the garden. 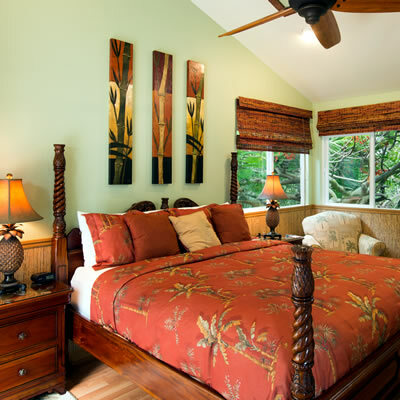 Second story room has a bright airy feeling, tropical ceiling fan. Treetop and garden views. French doors open to the roof top deck. Among the tree tops, this room has a spacious green feel. Offers garden view looking up to the mountain. Roof top deck is just steps away. Set amongst the trees, this spacious bungalow offers self-contained living with kitchenette, living room, and its own private lanai. 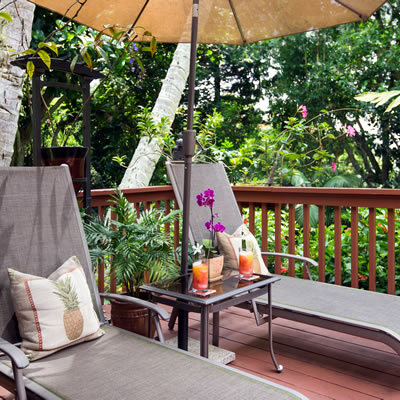 The Mala Hale Bungalow boasts its own private lanai. Enjoy a beverage, read a book, or simply relax in your own secluded area. 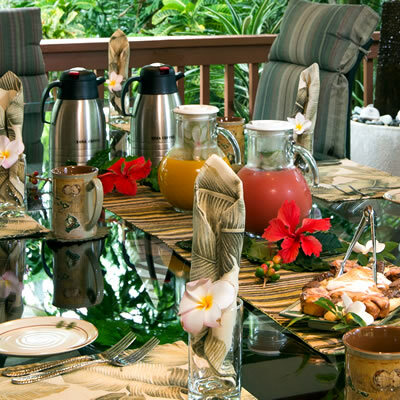 A generous breakfast is served each morning for all our guests, along with tropical fruits, Kona coffee, teas & juices. 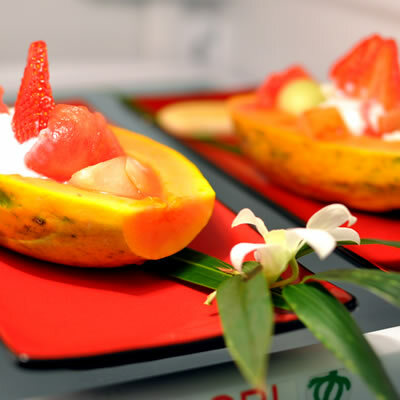 Many of the fresh fruits served with our sumptuous breakfast each morning are grown right here on our Honu Kai property. 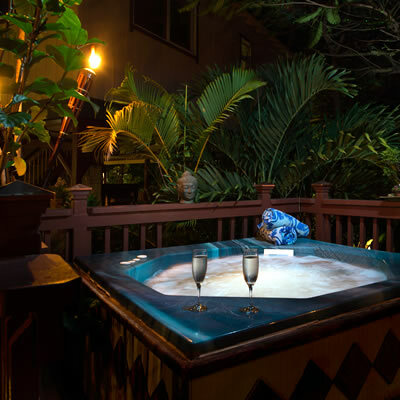 Enjoy our "Evening of Romance" under the Kona stars from our hot tub set among the lush gardens. A perfect end to a day of sightseeing! Second story sun deck off the Lani and Mahina Suites welcomes all guests. Tropical tree top views and vibrant sunsets. Granite outdoor kitchen with gas BBQ, 24hr. coffee & tea station, knifes, utensils, and full size refrigerator for our guests. Some of our guests are not exactly human. 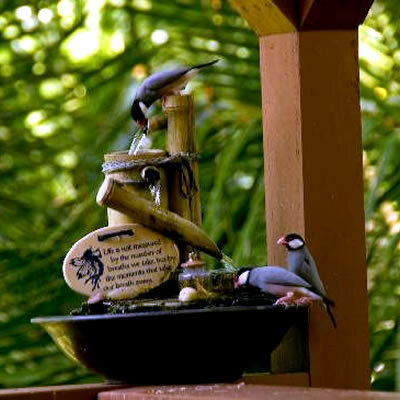 Java sparrows and geckos visit the lanai every day. You might just get caught up watching them! When you contact us, don't forget the time zone differences! We are on Hawaii Standard Time (no daylight savings).